Today I had a dermatologist appointment at 10 am, so I got up later than usual to start my bento. The stupid part is that last night I had only drawn out my box and where the rice would go, so the rest was all impromptu bentoing. End result is that I ended up late for my appointment, oops! At first I was going to make a boy and a girl, but when I had to make the boy’s hair, I had no idea how. Then I started digging through all my food cutters and after going through bears and bunnies and all kinds of silliness, I finally realized that with blonde hair, the girl would make a great Goldilocks. I thought of this while driving the kids to school. Before I get to the bento details, I’d like to point out that I’m using my only single serving bento box (my other is a giant three tiered monster) made out of metal. This box is available for online purchase from Life Without Plastic, a company founded by parents Chantal and Jay from Canada. The Life Without Plastic site and store is their way of contributing to a healthier planet. In order to further their cause, the folks over at LWP are graciously sponsoring a contest. Keep reading to find out how you can win the bento box I’m using today! I don’t actually mean you’ll get this box I’m using, ew! I have a new, unopened box for the winner. This particular box is their 6 inch oval lunch box, made out of stainless steel. It’s actually a pretty big box, I was able to fit a substantial amount of food in it. Sorry, but I have no bentorial today. Doing things on the fly meant I was taking things in and out and in and out to figure out where it should all go. The rice went in first. I used 1 cup of cooked rice and pushed it all to the side with my shamoji. After that, the lettuce went in. The meat under Goldilocks is chicken katsu, already sliced up. 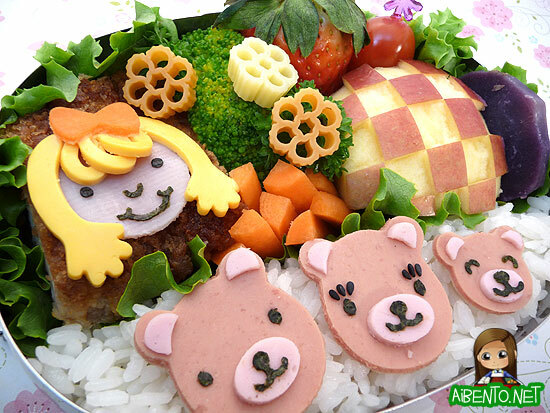 Goldilocks is made out of ham, cheese, carrot, and nori. The piece of broccoli went in next, then the checkered apple, which is resting on a thin slice of apple to give it more height. In between the broccoli and apple are some baby carrot sticks. On the other side of the apple is a slice of Okinawan sweet potato, above the apple I have half a strawberry and a grape tomato. 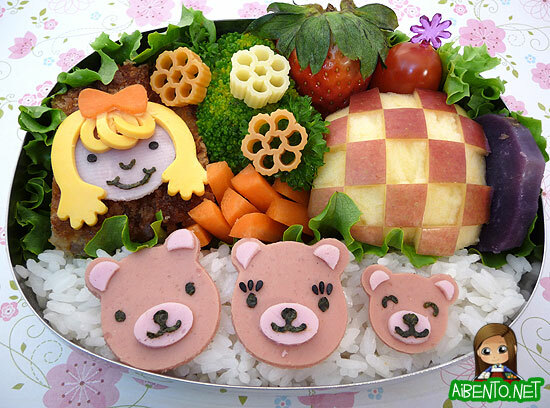 The three bears are made out of bologna and fish sausage. I used nori for their facial features and sesame seeds for Mama Bear’s eyelashes. I just ate them all. They were yum! Last of all I added three fiori pasta. Anyway, entering the drawing for the Life Without Plastic bento box is easy. Simply post a comment here with a pledge to replace one of the plastic items you use. The drawing will be open for entries until the end of the month. I will draw a winner by random in the early part of April. One entry per person, please! Please do not leave your email address in the actual comment as that would display it to everyone. Fill your email address into the email box and your address will be revealed to me, but hidden from everyone else. In a way it’s rather ironic that I, Plastic Bento Accessories Hoarder Extraordinaire, would be hosting a drawing to promote less use of plastic, but in another way I’m probably as good a place to start as any since I obviously have an addiction to plastic products. For my own pledge, I will be replacing all my plastic shamojis (rice scooper) with bamboo shamojis. I even have a mini bamboo one to replace my mini plastic one, which I hold dear to my heart! Please take some time to look around the LWP site (http://www.lifewithoutplastic.com). They have a lot of great products, including a GORGEOUS cedar bento box that I will be reviewing in the coming week and some metal dish sets for kids that I may end up buying as birthday gifts. Mr. Pikko was concerned about plastics from China long before all the reports began popping up in the news. I have a feeling the arrival of a box of these bowls and cups would be a welcome sight. Oh, best scene of the night in last night’s Lost?